St Andrew's Patristic Symposia were inaugurated in 2009 and originally took the form of a series of scholarly lectures delivered annually throughout the month of September, two every week. Since 2012, the annual symposia adopted the form of regular, two-day conferences. In the wake of the sixth edition (2014), the conference has become biennial. From the outset, the symposia proved to be an open space for crossdisciplinary approaches to the patristic phenomenon, and so they remain. For this reason, our patristic symposia have become a welcoming framework for scholars interested in the Church fathers and mothers, irrespective of their field of expertise, academic affiliation and denominational background. This aspect is evident, for instance, in the diverse expertise of the keynote speakers and contributors to our previous symposia, whom we acknowledge here with gratitude -- an expertise which spans from dogmatic theology to ethics and Christian education, from early Christian studies to philosophy, from classical studies to Church history, and from scriptural exegesis to liturgics and patristic studies. 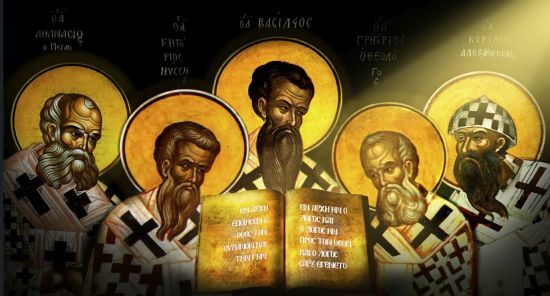 The first three symposia dealt with the Cappadocian fathers, Saints Basil the Great, Gregory the Theologian and Gregory of Nyssa; the next two addressed matters pertaining to the Alexandrian tradition, mainly focusing on Saints Athanasius the Great and Cyril of Alexandria; the sixth symposium undertook to explore the many connections between the Alexandrian and Cappadocian traditions, whose intersection represents the foundation upon which the Byzantine synthesis was built. The Symposia have welcomed, likewise, papers on related and unrelated authors, trends and events. After all, the ultimate goal of this series is to rekindle the fire of traditional wisdom at the core of our disoriented society; what better way to achieve this goal than by studying the Church fathers and mothers? Held within the premises of the College, St Andrew's Patristic Symposium 2016 will focus on the personality and contributions of Saint John Chrysostom. Traditionally acknowledged as a great orator, scriptural interpreter and dedicated shepherd, in recent times the significance of Chrysostom is primarily assessed from the viewpoint of social history. Very recently, his input to the notion of free will has opened new avenues for exploration. The Byzantine acclamation of Chrysostom as an ecumenical teacher and the references to him in the 14th century hesychast disputes would require further assessment. A broader, interdisciplinary approach to Chrysostomian studies will cast further light on the various contributions of this venerable figure of early Christianity. This, precisely, is the object of our conference. Topic: John Chrysostom after Chalcedon: A Useful Ecumenist? For the first time in the history of our symposia, the 2016 edition offered two postgraduate bursaries of $500 (each), generously funded by Australian Research Theology Foundation Inc.
A collective volume resulting from the 2012 and 2013 symposia, on the Alexandrian Fathers, was published in September 2015. It contains papers already published in Phronema and an invited contribution from an international scholar. Here are the details of the volume: Doru Costache, Philip Kariatlis and Mario Baghos (eds), Alexandrian Legacy: A Critical Appraisal (Newcastle upon Tyne: Cambridge Scholars Publishing, 2015). ISBN (10) 1-4438-8001-9. ISBN (13) 978-1-4438-8001-5. A collective volume containing select peer reviewed papers from the 2009-2011 symposia, dedicated to the Cappadocian Fathers, was published in 2013. Here are the details of the volume: Doru Costache and Philip Kariatlis (eds), Cappadocian Legacy: A Critical Appraisal (Sydney: St Andrew's Orthodox Press, 2013). ISBN 978-0-9775974-9-9. Most papers presented for the St Andrew's Patristic Symposia have been published in our Faculty's theological journal, Phronema, beginning with its 2010 monograph issue. After peer review, the resulting papers of the 2014 symposium will be published in any of the two annual issues of our journal, Phronema (vol. 30), in 2015, the second one being entirely dedicated to the symposium. After its sixth edition (2014), the St Andrew's Patristic Symposia will be organised biennially. The next edition is scheduled for September 2016.